Recently as we were helping a client move into a new space an interesting question came up – where do we put all of these books? This client happened to have a very large collection of coffee table books as well as novels. We had to get creative and this got me to thinking, what do you do with all those books? The most obvious solution for this problem is to stack a few favorite books on the coffee table. One thing to keep in mind is if you are going for this look, keep it simple and just add some flowers and maybe one other item, let the books be the star! Another great way to style books is to go minimal and simply organize them by color and stack horizontally. This is very easy to do and makes a huge difference! If sorting by color is not for you, books look great stacked horizontally as an alternative to the traditional way of lining them up. The secret to this look is to have nothing else on the shelf. While we are talking about bookcases, I love this image of this shelf crammed with books. Being a book lover myself I find it interesting that the stylist has used every inch of space for books! Maybe a bit chaotic for some, but here it definitely works. For those who have a great collection of coffee table books, this is another option. Although it seems easy, creating a stack this perfect does take some work! 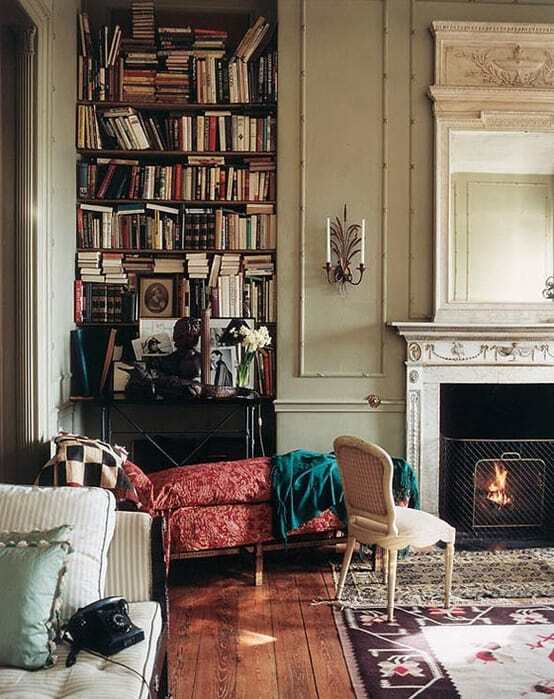 Although it is unfortunate to have a non-working fireplace, filling it with books is a great use of the space and adds some color to an otherwise dark hole! This photo shows the most space efficient way to stack books, simply assemble them on a bench to create this industrial look. We tend to acquire a lot of stuff through the years, I for one am a huge fan of sorting and purging but the thing I can rarely get rid of is books! I feel that books are great to have around and can often come in useful. So as we are all trying to downsize and simplify, I would recommend keeping the books in this age of technology, after all they may be scare one day!